One of the many confusing items in the home improvement industry is the difference between engineered wood and engineered hardwood flooring. A quick assumption would indicate that they are basically the same thing. This however, is not correct. There is a major difference between engineered wood and engineered hardwood flooring. Engineered wood products (Figure 1) are materials that have been made out of a host of natural materials, in some cases they are not woods at all but are generally plant species, such as sugar cane stalks, wheat and rye straw. Engineered wood uses the remains or leftovers of lumber milling, both hardwood and softwood, such as chips and sawdust and/or it can utilize small trees and branches that because of their size cannot be milled into lumber products. These materials are then mixed with adhesives and pressed or rolled into lumber shapes and dimensions. These materials are not inferior to natural wood products, they are different and in many cases, when used in the proper applications, have some technical benefits over natural wood products. Engineered wood products do not generally warp. Warping is caused when the wood fibers absorb or release moisture. 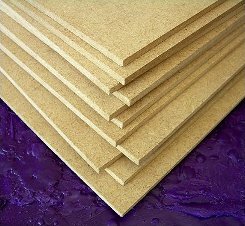 As there are no true fibers within engineered wood it does not absorb or release moisture in the same manner as natural wood. Engineered wood is not generally used in areas that are visible or to be finished. In most cases they are also less expensive than natural wood products. Engineered hardwood flooring is constructed by laminating a thin layer, usually 1/8 inch; thick, over plywood, as shown in Figure 2. The layer that resides on top of the plywood is natural hardwood, it is not an engineered wood. Because it is laminated to plywood, the engineered hardwood flooring is much more stable than traditional hardwood boards. This is especially true in the area of expansion and contraction, as plywood is less susceptible to humidity. Engineered hardwood flooring can be installed over most flooring materials with the exception of carpet. Engineered hardwood flooring can be glued down, stapled down or can be installed as a floating floor. Relative to traditional hardwood flooring it is thinner, usually 5/8 inch. It can sound hollow or provide an echo when walked on and hence does not provide the same underfoot feel as traditional hardwood. It cannot be refinished as often as traditional hardwood because the surface layer of hardwood is only and 1/8 inch thick.